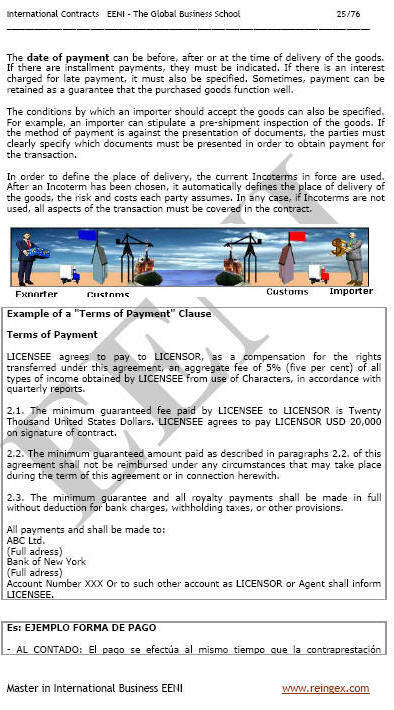 Syllabus of the Online Course (Subject): International Contracts. Vienna Convention. Arbitration. Clauses. This course (subject) aims at familiarising the student with International Contracts as they are used in international trade transactions. Credits of the Online Course / Subject “International Contracts”: 3 ECTS. A contract is a single document, in which the rights and obligations of the exporter and the importer are stipulated. International Trade practice shows that the majority of transactions are carried out without signing a contract. However, it is strongly recommended establishing an international contract of sale for all international transactions. One can avoid doubts and misunderstandings concerning what has been agreed during the negotiation of terms if they are set down in writing. In certain cases, a verbal agreement is legally binding, for example, when an exporter makes a sale at an international fair. Most foreign trade transactions do not use a formal contract in practice. However, the clauses in the commercial invoice and the incorporation of an appropriate Incoterm in the export price as well as national legislation will nevertheless imply certain obligations on the parties. In any case; we recommend using a formal contract. 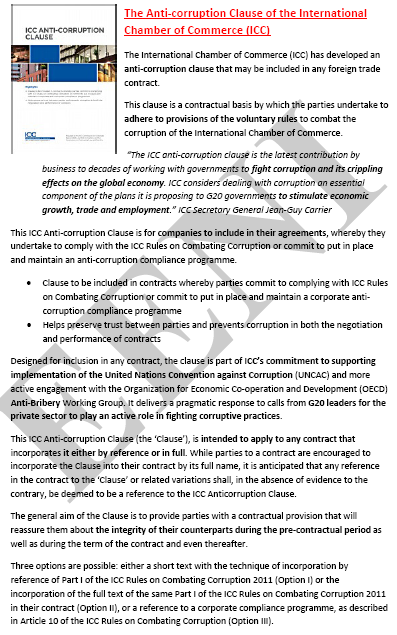 Here are the usual clauses of an international contract. However, one should call upon the services of a legal advisor to produce a well-prepared contract. Arbitration is a method of dispute resolution relating to international contracts of sale. A well-prepared clause on arbitration provides a basis to conduct arbitration duty in the case of litigation. The Vienna Convention on International Sales Contracts of Goods regulates the formation of international contracts of sales. The Convention was signed in Austria on 11 April 1980. Forty countries have adopted it, the majority of which are developed. The layout of a contract is left entirely up to companies; it can also be accepted in a verbal form; although there are signatories countries to the Vienna Convention who do not accept verbal agreements and only recognise a written form of a contract. 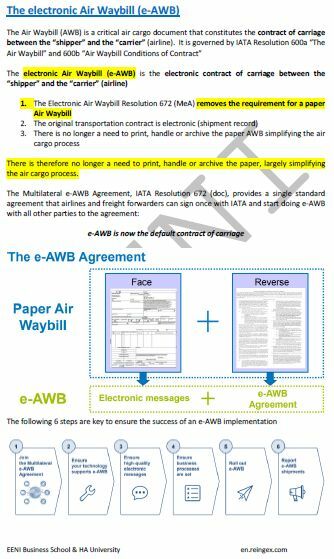 For a contract to be considered accepted the consignee's consent must be obtained. Silence cannot be interpreted as consent. 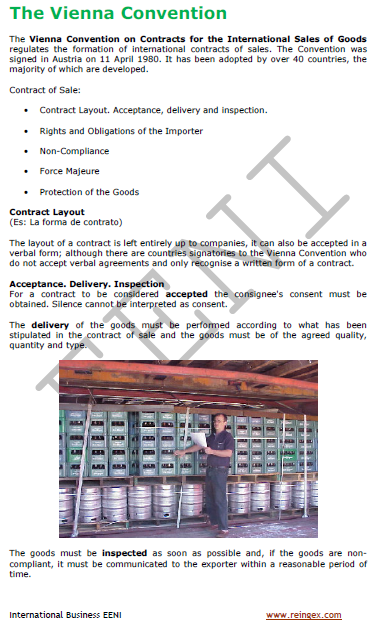 The delivery of the products must be performed according to what has been stipulated in the contract of sale, and the products must be of the agreed quality, quantity, and type. The products must be inspected as soon as possible and, if the products are non-compliant; it must be communicated to the exporter within a reasonable period. 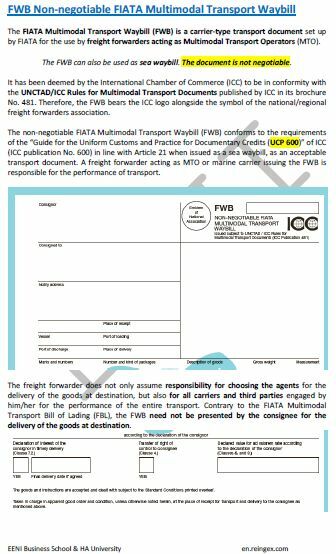 Forwarders Certificate of Receipt (FIATA FCR): it is not accepted as a transport document according to the rules of letters of credit.